The work of John T. Flynn (1882–1964) is proof that the job of journalist once meant something very serious. As We Go Marching is a work of scholarship by any standard. It is well written, to be sure, but it covers the history and meaning of fascism with fantastic erudition, tracing its permutations from Italy to Germany to the United States. The passion is not disguised, but it is backed by incredible detail, relentless logic and powerful analytics. It is easy to identify this as Flynn’s greatest work, but actually there is some serious competition for that designation. Before the New Deal, Flynn thought of himself as a liberal. He was right. And he never changed his mind, either. He was a liberal. He believed in progress, free speech, free inquiry, small government, maximum freedom in every sphere of life. That included the economic sphere. Here is where the crowd that called themselves liberal in the 1930s and ’40s departed from him. Flynn believed the liberalism also meant a free economy. He was an opponent of corporatism, of state intervention, of state-created cartels, of authoritarian rule. The New Deal was all those things. Flynn shows that it culminated in militarism and war — the New Deal by other means. It was a continuation and not a departure. We were fighting against fascism abroad while imposing it at home. In the end of supporting freedom around the world, the government was taking it away from us at home. In this sense, it is impossible to call Flynn a conservative today. His opposition to war and war socialism was so intense he would never join the “conservatives” in whooping it up for the Cold War. He remained true to his convictions his entire life. It is a marvel that this book was ever published, given the way all governments censor the press during wartime. It did get published — with an advertisement for war bonds on the back cover. At the same time, it meant the end of his career as a writer. He was once nationally famous. After the war, he could hardly find anyone willing to publish his works. He died in obscurity — and this was after an incredible lifetime career of some of the best journalism in American history. I’ve variously felt a strong sense of sadness for what happened to Flynn. But when you read this book, that sense goes away. He was a man of remarkable courage and brilliance. He could not but write and speak the truth. He knew that it would come at a price and it was one he was willing to pay. And look at his legacy! This book is truth spoken to power, and it speaks still and will continue to do so for generations. Everyone’s favorite Chief Liberty Officer, Jeffrey Tucker, is back for another dose of Liberty Classics. 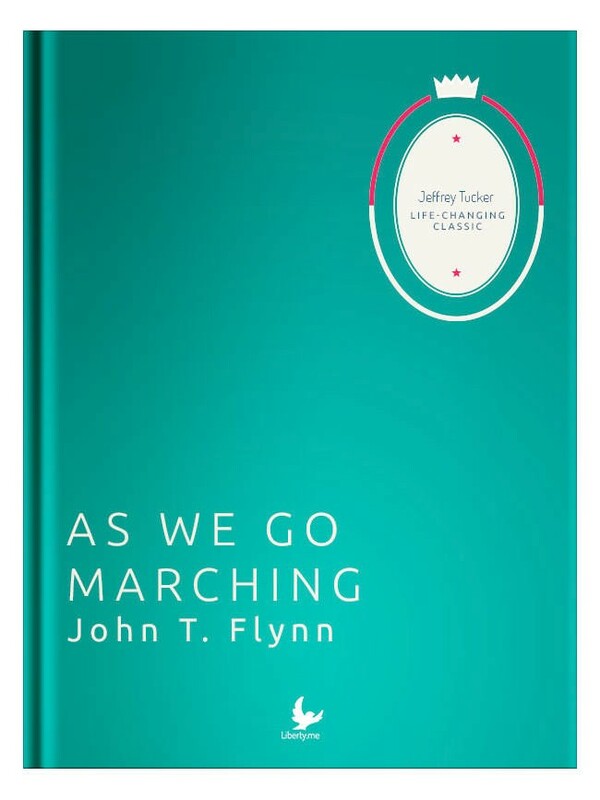 This week, he’s chatting about John T. Flynn’s As We Go Marching. The work of John T. Flynn (1882–1964) is proof that the job of journalist once meant something very serious. As We Go Marching is a work of scholarship by any standard. It is well written, to be sure, but it covers the history and meaning of fascism with fantastic erudition, tracing its permutations from Italy to Germany to the United States. Flynn was a man of remarkable courage and brilliance. He could not but write and speak the truth. He knew that it would come at a price and it was one he was willing to pay. And look at his legacy! This book is truth spoken to power, and it speaks still and will continue to do so for generations. Sheldon Richman and Lucy Steigerwald understand liberty like Steve Irwin understood crocodiles. They’re masters, plain and simple. This week, we turn to realism, utopianism, and guns. Check out Sheldon’s article on the tragic Umpqua Community College shootings.